It might just be me, but my January flew by, and I worry I don't have that much to show for it. At least February got off on the right foot, I met up with Jessica for brunch at The Butcher, The Baker, The Cappuccino Maker for brunch and tried one of their beautiful, albeit overpriced, color burst lattes. 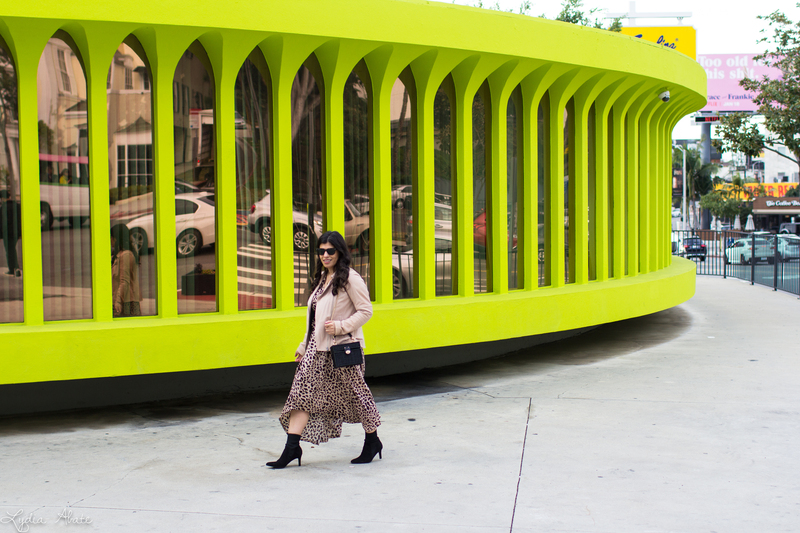 After brunch I found myself another pink building for outfit photos, clearly it's becoming a theme, or there are just too many pink buildings in California! We had another rainy weekend, and watched the Superbowl at home. I'm always more interested in the food and the commercials, so as long as I've got buffalo chicken and onion dip I'm happy. I can also say I really enjoyed the west coast time difference, the game ended and I still had my whole night ahead of me! Did you watch the Superbowl? If so, which commercial did you enjoy the most? I'm leaning towards the Amazon Alexa. 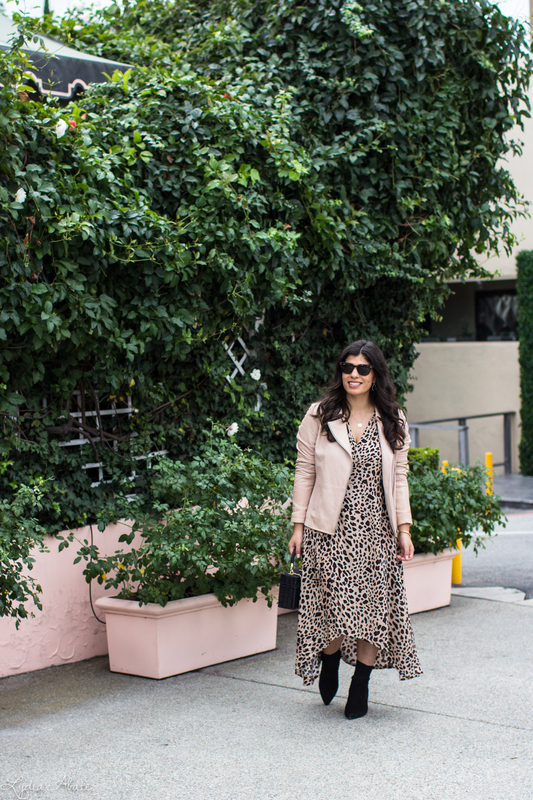 That is a really stunning leopard print dress - and it looks perfect paired with the blush jacket. I love seeing leopard outfit inspiration! My January was painfully slow and February, so far, is looking to be about the same, unfortunately. It's also -45 here this morning and as much as I like winter, that's too much even for me. So things are definitely not off to a great start. I didn't watch the Superbowl (I don't think I've ever watched one, to be honest) but I can appreciate it would be nice to still have time after it ends ahead of you. Such a pretty look! I love that the dress is the same color as your jacket! I didn't even bother watching the Super Bowl. No one had a party and Christian doesn't care for football either so we just did our own thing, hah. Obsessed with this outfit - the jacket over the dress is the perfect touch. Also, I loveeee the Butcher, The Baker, The Cappuccino Maker! One of my fave LA cafes! 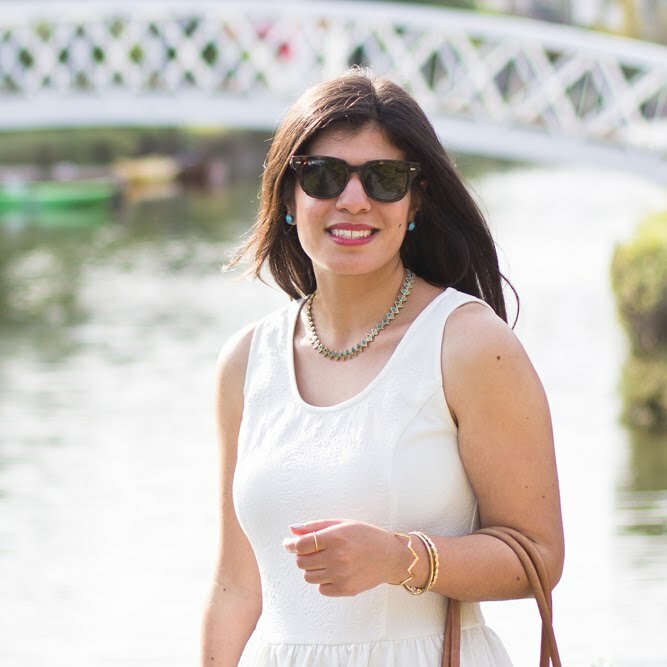 This dress is gorgeous on you and love it with the blush jacket! Now that's the way to do leopard, Lydia!! We watched Mary Poppins last night instead of the Superbowl....at least there was a happy ending!! This whole look is so fabulous!! Totally in love with that gorgeous blush color! 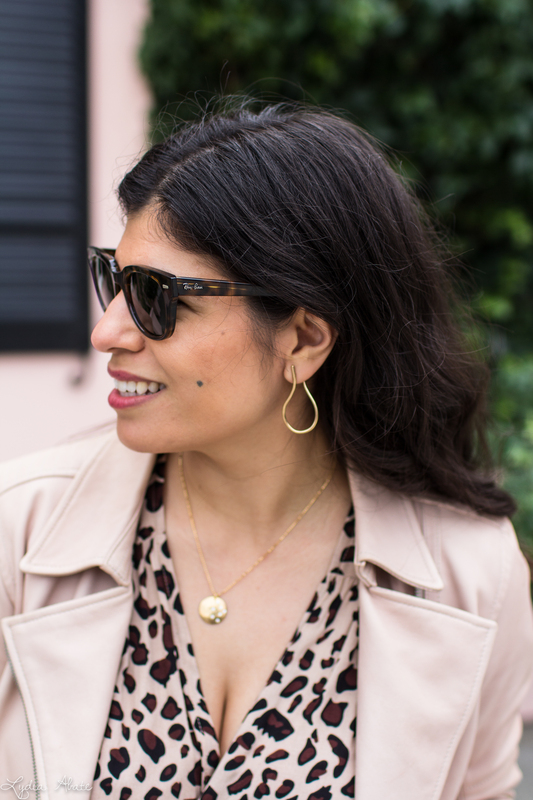 Blush and leopard is the combination I never knew I needed! Looking to chic babe. I don't watch the superbowl, but I did enjoy the toy story commercial! It's funny that I rarely see anything about the game but there are always reviews of the commercials online, haha! January was insanely crazy busy. It felt like it went by too quickly but also way too slow. Don't know if that makes sense, but that's how it felt. 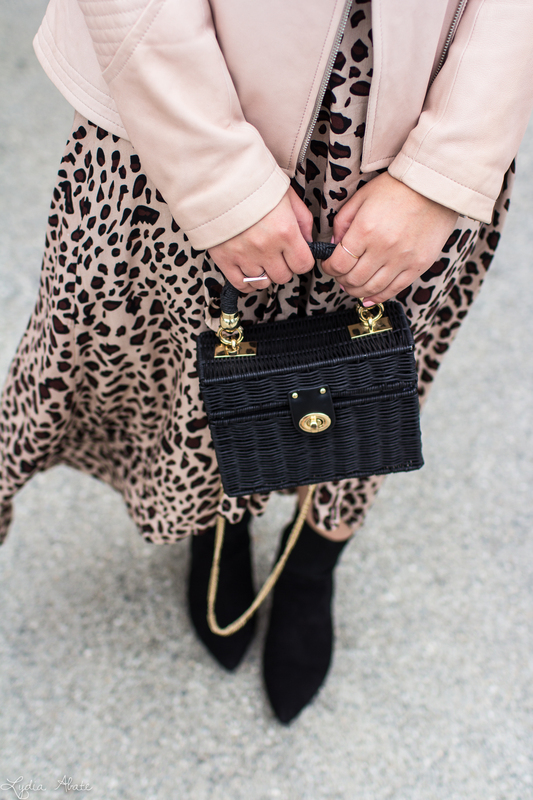 Love the blush tones in this outfit-- and the contrast of that cute purse! A perfect combination! Your purse is really stealing my attention. So adorable! You look gorgeous in this dress! 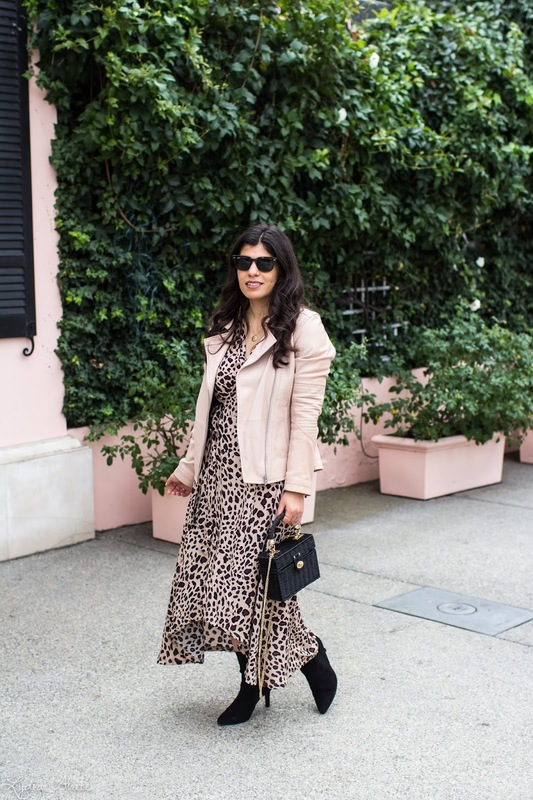 Love the blush and leopard combo! Just casually dealing with MAJOR heart eyes over here for this outfit. Seriously, girly, this is gorgeous! Definitely my favorite outfit EVER from you! I really love the leopard with the pink coat! Pink buildings are such wonderful backdrops. I am totally crushing on your outfit! That leopard print is so cute and I love the pink jacket and black booties. January went on forever ... and I am glad it is over now. :D Love your outfit ... it is so chic and edgy and evergreen! This will forever be one of my favorite combinations! I love how you styled this with booties. The blush is so chic Lyddie! I love the leopard print and I have loved seeing that latte on your insta! The Alexa commercial was definitely cute! I liked the dog part. 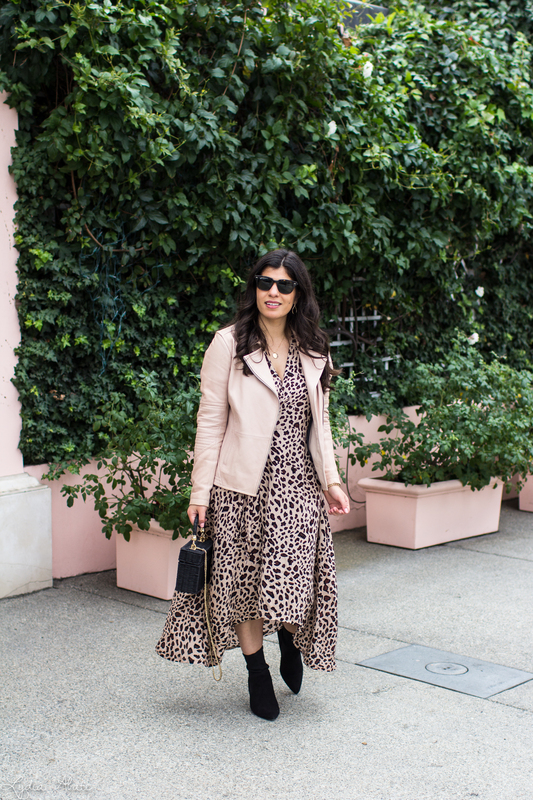 I am just loving the blush and leopard! I really need to try that combination! You look fabulous in that dress and love it paired with the blush jacket. Ooh I am totally loving this outfit--it all works together perfectly and I love the colors!! It fits right into my color scheme for this month. I didn't watch all of the Superbowl, but tried to watch commercials when I could. I agree, the best one I saw was the Amazon Alexa one. I'm with you and I think January flew by! It seems like the rest of the world thought it was slow?! And girl, I am OBSESSED with this dress! Seriously so gorgeous! Leopard and blush- one of my favorite combos!!! So cute!! Oh the pink buildings must be such a treat - i think these shots are marvelous Lydia. Love the dress and the pink jacket. I never watch the superbowl. Such a chic and sassy look dear! 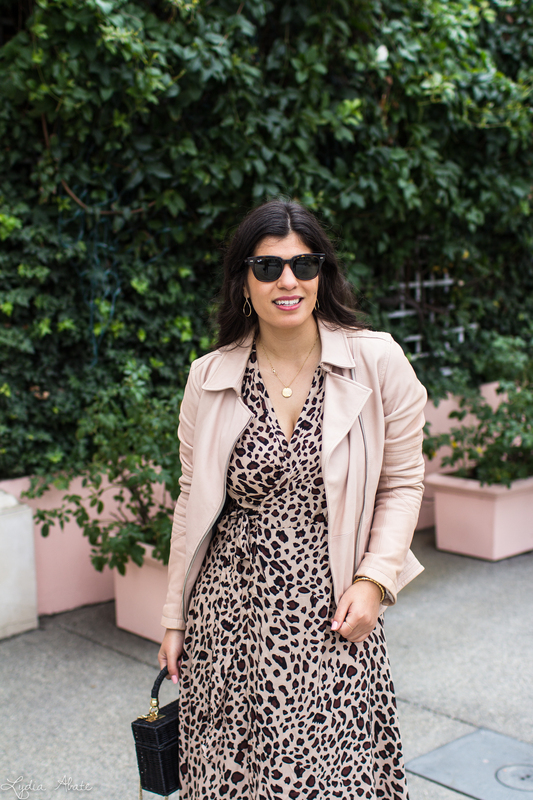 Love the combo of blush jacket and leopard dress.